Except that… whoops! HDDs are not only alive and well, they are actually – gasp! – being used very heavily and in vast numbers by every single hyperscale storage provider on the planet. Not to mention lots and lots and LOTS of enterprises of all shapes and sizes. Oh, and they also keep getting denser, cheaper, more reliable and more power efficient. Guess there’s still some utility for disk after all. Now this in not in any way, shape, or form meant to imply that flash is bad. Au contraire. Flash is awesome! If it’s used properly, that is. Flash media makes an exceptionally sweet cache layer. The trouble is, when you start trying to use flash drives as the primary and sole persistence layer for petabyte-scale workloads, the harsh economic realities of flash media vs. mechanical media rear their ugly head. I know what you’re thinking. “But..! But…! Compression! Dedupe! Thin provisioning!” What about all that efficiency?! First of all, data reduction is neither free nor deterministic. It costs CPU cycles, sometimes a lot of them – unless you’re rrrreally clever about how you implement it. (SPOILER ALERT: we’re rrrreally clever about how we implement it! More on this in another blog post to follow…). If your system is relying on heavy data reduction to mitigate cost, you’re probably suffering from less than optimal I/O service times – especially at peak load, when you can least afford it. Second, applications and services are getting increasingly clever about compressing, containerizing and optimizing data ‘footprint’ at the point of origin. So… if you’re trying to compress data that is not very compressible to begin with, your amazing compression ratio – the one that the all-flash folks sold you – deteriorates to a state of considerably less amazing as time passes, and your effective cost is now double or triple what you expected. So, what does this all mean? Glad you asked! We think it means that the “all-flash future” is still just that – a possible future. Maybe more distant than some would have you believe. 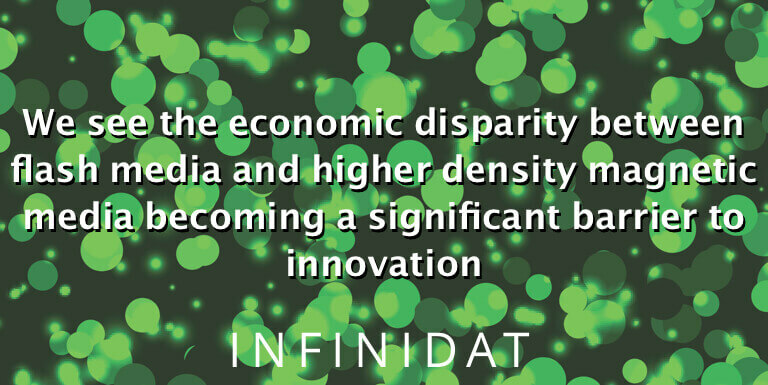 We see the economic disparity between flash media and higher density magnetic media becoming a significant barrier to innovation and adoption as the volume of data we globally create, move, store, manage and act upon continues to grow at unbelievable rates. We also believe that the future of data storage isn’t “all flash.” It shouldn’t be “all” anything. Why constrain ourselves based on media? Or worse yet, based on a single class of media? Designing a storage system based solely on the media it uses is like constantly retrofitting the same 1968 VW Beetle with each year’s newest, most sophisticated lightweight Formula 1 racing engine. At some point, the overall design – chassis, frame, exterior, curb weight, controls, safety features, etc. – has to be revamped to fully optimize overall performance and capability. We realized this a while ago – in 2011 to be exact, the year INFINIDAT was founded. It was apparent then that an all-flash data center wasn’t a sensible or sustainable model for the future of multi-petabyte-scale workloads. What was needed was a significantly different and more sophisticated storage software architecture. An architecture that was adaptive and flexible enough to optimize the performance and durability of any media type, present or future. So we gathered together the smartest and most experienced storage minds in the world, built them a huge state-of-the-art development lab, and turned them loose on this grand challenge. The result was the INFINIDAT storage operating system – the most powerful, advanced, agile and future-proof storage system ever conceived. After shipping over 1,700 petabytes of storage in the last few years, we think we’re onto something. Something you should know about. Want to learn more? We’ll be at VMworld Las Vegas (Booth 324) and Barcelona (Booth G201).